The healing and soothing properties of essential oils have been known for centuries. Distilled from raw plant matter, essential oils can be used to treat respiratory ailments likes asthma and irritating coughs; for skin conditions such as eczema or breakouts; to relieve stress and prevent anxiety; and to give your home a fragrant and inviting ambience that your guests will never want to leave. Essential oils can be used for their health benefits in many ways but one of the most common and effective ways is diffusion. Diffusion is the release of essential oil particles into the air where they can be inhaled and absorbed. Diffusers are often filled with water and drops of oil, or oil infused cartridges, and powered by battery or electrical outlet. These diffusers are great but to do their job effectively they need to be properly cleaned and maintained after every use. Why is it important to clean my diffuser? Essential oil diffusers are often the unsung hero behind the fragrant home and the invigorated body. But while you’re enjoying the healing properties of your favourite essential oils, your diffuser may be suffering from neglect. Over time and use, particles from the essential oils and scale from the water can build up and clog the mist vent, preventing your diffuser from working properly. Additionally, the residual oils will tarnish every use, meaning your aromatherapy isn’t as pure as it could be. If you’re noticing a build-up of oil residue or that it is simply not working as well as it should, then you need to know how to clean an essential oil diffuser, quickly, easily and naturally. In this guide I explain how to clean an ultrasonic oil diffuser with minimal effort and without the use of harmful chemicals. Let the diffuser do the work for you by following these seven easy steps to run a ‘clean cycle’. First things first. When learning how to clean a diffuser, it is important to remember that water and electricity don’t mix! Whenever you’re refilling, cleaning or moving your essential oil diffuser, turn off and unplug the adaptor from its power source first. Fill the water reservoir up to about half way with cold clean tap water, stopping well before the maximum fill line as you will only be running the diffuser for a brief amount of time. Oil residue can often build up and stick to the inside as well as on the glass and plastic components of the diffuser. Pure white vinegar is a great natural cleaning agent—add up to 10 drops to the water reservoir. Plug in your diffuser and run it for about 5 minutes. This will be enough time for the water and vinegar to move throughout the diffuser and clean it. After turning off and unplugging the diffuser, pour out the remaining water from the reservoir. Pour from the back of the diffuser so you don’t spill any water on the front operating buttons. Using a cotton ball or wipe dipped in vinegar, gently wipe down the interior including the ultrasonic plate. Simply rinse out the inside of the diffuser with some clean water then dry all over with a clean cloth. Your diffuser is now as clean as new and ready to continue diffusing your favourite essential oils. Frequency is your friend! One of the most important things to remember when learning how to clean a diffuser is that you should do it often. After every use, give your diffuser a quick wipe down with vinegar and a rinse. To keep your diffuser in its best operating condition, you should run the clean cycle at least weekly. Don’t use abrasives, aerosol sprays or solvents to clean your diffuser as you can damage the plastic and taint the aroma in future uses. Never submerge your diffuser in water. 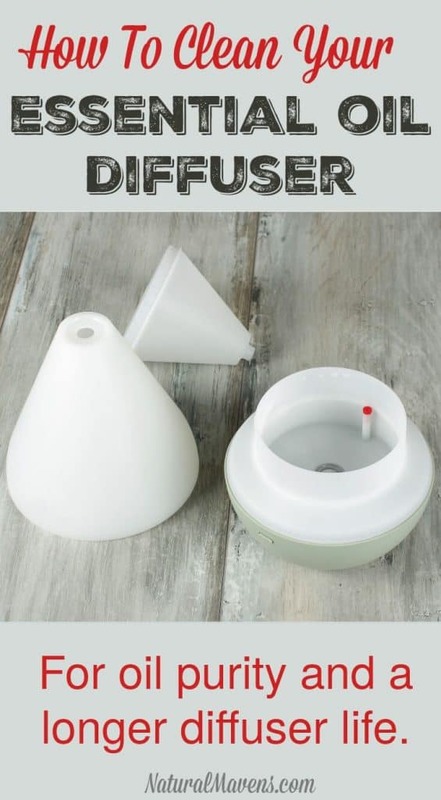 While this guide is based on how to clean an ultrasonic diffuser, with some minor variation, you can follow these instructions for most diffusers. If in doubt whether these instructions for how to clean an essential oil diffuser will work for your particular diffuser, follow the manufacturer’s instructions. Just remember that the more frequently you clean your diffuser, the more pure and effective the diffusion of essential oils will be, and the longer your home diffuser will last. With just a little TLC your essential oil diffuser will keep working for you and your family; calming minds, healing ailments and adding an inviting, purified atmosphere to your home. UPDATE: Several people have contacted me to say that Young Living diffusers cannot be cleaned using vinegar as it will void the warranty. I have no experience with these diffusers so was unaware of this. As I recommend above, always check the manufacturer’s instructions before cleaning. A tip for cleaning Young Living diffusers is suggested in the comments below – use rubbing alcohol on a Q-Tip to clean. Just what I needed! I’ve noticed buildup in my diffusor lately. Thank you!! I was looking for your email to contact you about this article. FYI Young Living suggests rubbing alcohol on a Q-Tip to clean. Do not use vinegar, it will void your diffuser warranty. I am glad you updated your post. The graphic that you chose at the top of your post is a Young Living diffuser (the dew drop design), so I can see how people can be easily confused by your advice. My diffuser has begun to make an unsettling *grinding* sound when I first turn it on. After about a minute it runs quietly and without problems. Should I be concerned about the grinding sound? Is that just something that comes with use? I have the DoTerra Petal diffuser and have used it about three years. It gets cleaned frquently but not every single day. I have run the deep clean cycle, too, with the vinegar. Visually, it looks like a brand new diffuser. Everything else is great – it’s just the issue with the sound that I’m concerned about. Thanks! Hi McDonna, any time there is a new sound with something I think it is an indication that it may be on the way out. I had a diffuser (different brand) that started to make some noises, and then would splutter a bit before starting. Eventually it didn’t even splutter and needed replacing 🙁 I hope this isn’t the case for yours and you get another 3 years from it. Good luck! what do U do with empty oil bottles??? – use them for taking a oils with you when you travel. Hi ,Just sharing another tip. I remove the lids and orifice from the bottles and place all of them in epsom salt to soak for a day or so . Wonderful for a bath. What a great idea 🙂 Thanks for sharing Patricia. Do you put the bottles just upside down in dry epsom salt… or make an epsom salt and water mixture and soak them in that? The way Patricia has described it is in the dry Epsom salt. They absorb the oils, leave the bottle clean and then you can use the salt (with essential oils absorbed) in your bath. Great idea! You can take your empty bottles, remive top and insert. Place all the anove in bag of epson salts. Leave for several days. You can put several different empty oil bottles in the salts. You end up with a wonderful relaxing epson salts blend to soak in. Hi Kristy, thanks for this, it worked perfectly to clean out my diffuser! PS I tried rubbing alcohol previously but this worked better so thanks! Hi Kristy, new to this diffuser thing, and I just killed my first one, sad I know. I accidentally poured half a bottle of an oil into diffuser, forgot it was one that needed a dropper. I wiped it out with paper towel, but did not clean this way (just found this), and now I will definitely follow since my new diffuser just arrived. I used a Q-tip to clean little white filter, after that water just poured out the bottom. I don’t know which of these could have cause leak, but I don’t want it to happen again. Do you have any recommendations for cleaning the little filter at the bottom of pot? Thank you so much for this information already! Hi Sherry, sorry to hear about your diffuser mishap 🙁 For the new one, I suggest not touching the filter. When it comes time to clean the diffuser, just follow the method outlined above and this should clean the filter sufficiently. Good luck!